I've always been a bit embarrassed by my inability to produce perfectly hard-boiled eggs. I think it generally has to do with time. Regardless, I wanted a new way to prepare hard-boiled eggs and recalled a conversation I had with my husband when he came home after a day of working at his Korean Middle School. He said to me, "Did you know you can make hard-boiled eggs in an electric kettle?" I gave him the I-think-your-crazy-look and asked "How?" He couldn't give me a complete answer and just referred to one of his co-workers arriving at work that day, plopping some eggs in a kettle and shortly thereafter eating a hard-boiled egg. Fast-forward a few months when I'm doing my best to eat breakfast regularly and need a few new treats to prepare quickly either the night before or in the morning. I decided to give it a shot and it works! Amazingly well in fact! Layer a few - 4-5 eggs in the bottom of your electric kettle. I've discovered that if I stack them, they bang against each other and crack, making a mess of cooked egg whites in your kettle, so just fill the bottom with eggs, no more than that. Next, fill the kettle with water, make sure each egg is completely submerged. Flip the switch and bring the water to a boil. Once the water has boiled and the kettle turns off, set a timer or watch a clock, for 15 minutes. Carefully pour out the hot water, remove eggs from the kettle (I use tongs) and run under cold water until the eggs are cool. Peel when ready to eat or prepare egg salad or deviled eggs or what have you. This is a very informative post. I've Morphy Richards Rapido Electric Kettle but I never did this. I see your's is from Philips. But I don't think that will matter. What I'm happy about is that now I can even boil eggs in kettle. Never thought about this earlier!! One of the best use of electric kettle. You can boil eggs any time. Electric Kettle made easy for boiling eggs because before that we want to take a pot and then boil water. 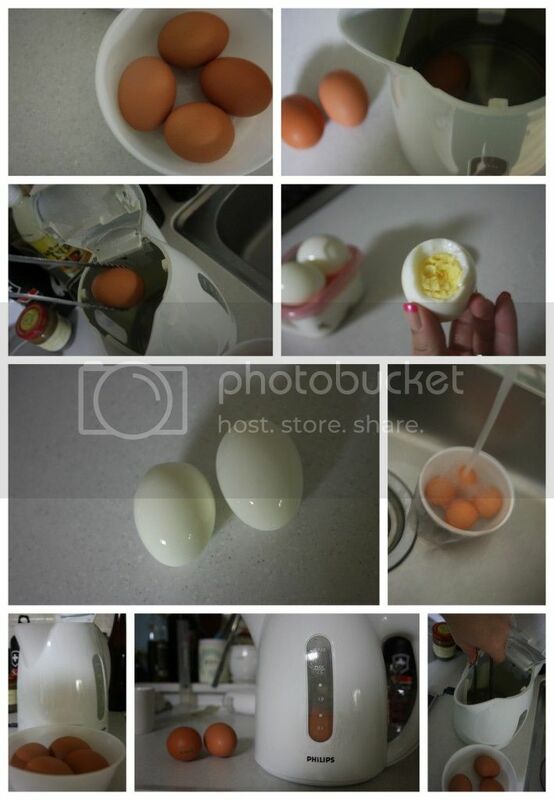 Thank you for adding this Kitchen Tip for hard boiled eggs..